Less time on the phone, more money in the bank, a faster system for booking jobs—all brought to you by client hub. When it comes to the field service industry, competition is fierce and your customer service can set you apart. You respond to customers promptly to book new jobs, work hard to provide the best possible service on-site, and collect reviews from happy customers once the job is done, all in pursuit of developing loyal customers and encouraging word of mouth business. Your ability to respond to your customers’ needs is why they keep coming back, but sometimes the back and forth can be overwhelming and unproductive. Dealing with a few unorganized clients can require hours of repetitive admin time if you are constantly answering their emails and calls to resend past due invoices and receipts. Small requests, the constant back-and-forth, the pursuit of superior customer service—these are all reasons we built client hub for our customers. In a nutshell, client hub is a better connection with your clients that saves you time. More literally, client hub is an online experience where your customers can view current and past quotes, invoices, and receipts, pay outstanding invoices, and request new work—all in one place. The time you used to spend on resending invoices and receipts is now available for productive work when you use client hub. Your clients simply click on their unique client hub link (included with every invoice you send them, or you can send the link manually), and they’re taken to a web page with your company branding that lists all of their current and past records. You’re providing 24/7 customer service without lifting a finger. 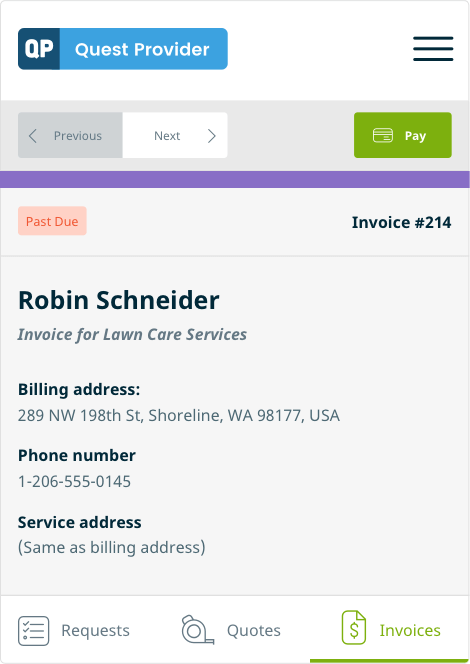 Your clients can access all of their current and past quotes, invoices, and receipts in client hub. [Client hub] saved me an hour of work when a local client of mine, overdue on their cleaning bill (about 8 invoices behind) couldn’t find record of them in their email inbox. All I had to do was send them one invoice link and they could view their service history in client hub. There are no passwords, login info, or usernames for them to remember. Kris Cook, President, KC Power Clean Inc. According to our friends at Fundbox, the average small business is waiting on $84,000 in unpaid invoices. And depending on the size of your business and nature of your work, even one past due invoice can have a negative impact on your ability to pay employees and fund new work. How can you help your clients pay you faster? Set up an ePayment option like Jobber Payments. Jobber customers bill for over $100 million in services each month, and ePayments get them paid faster than any other payment method, taking, on average, only 7.4 days to get from invoice to payment. Even cash came in at a far second, taking just over 2 weeks to get from invoice to payment. Send them a link to your client hub. If you enable Jobber Payments (it’s free with your Jobber subscription! ), or integrate with one of our other payment providers, you can offer an online payment option directly in your client hub. As soon as your clients see that they owe you for both their newest invoice and a past due invoice that they forgot about they can take out their credit card and settle their bill with you at their convenience, no cash run or check required. 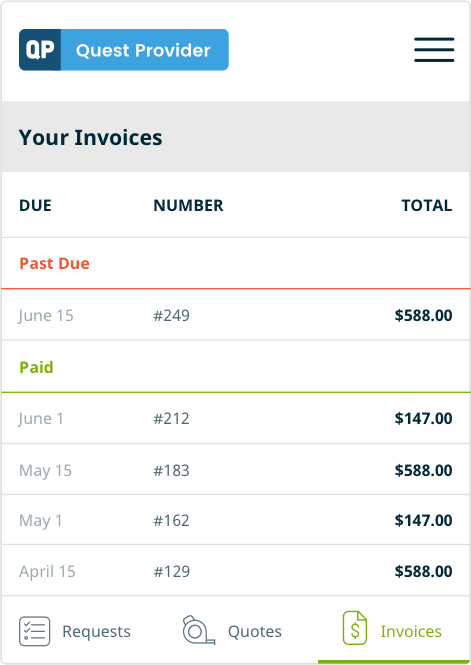 Your clients can pay for their invoices by clicking the 'Pay' button in client hub. Your clients might call or email you to request a service appointment when it works best for them. If you’re too busy to answer and respond to a phone call right away, a game of phone tag might follow. If you’re out in the field going from job to job, an email thread might take a couple of days to result in booked work. 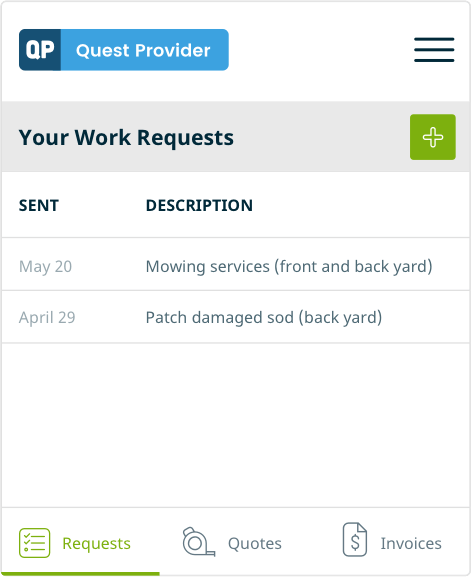 Work requests allow your clients to send you a detailed description of work they need done, and any work request submissions are available in Jobber where you can easily convert them into a new quote or job. Clients can send you work requests through client hub, and review sent requests. Existing clients can find your work request form in your client hub, and new clients can find a link to your work request form on your social media, or embedded on your website. Client hub allows you to send customers to one place to access the information they need the most, when they need it. By offering clients access to their records, your business is seen as open and transparent, you save both yourself and your clients lots of time from back-and-forth emails and calls, and your professionalism gets a boost (how many of your competitors are offering a company-branded online experience to their clients?). Visit our help center to learn more about enabling and using client hub. Looking to save even more time? Learn how time tracking with Jobber can help you get back several hours of productive time each week.